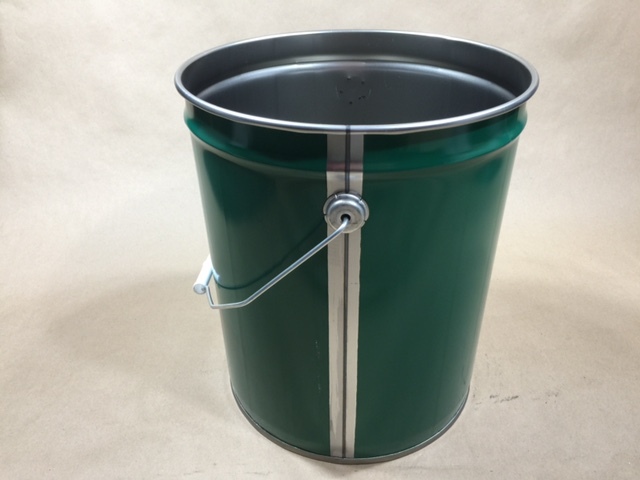 Yankee Containers offers a selection of steel cans or steel pails in sizes ranging from a small 1.5 gallon tight head (cover not removable) with a Rieke opening up to a 7 gallon tight head with a Rieke opening. Our open head (cover is removable) steel pails or steel cans range in size from a 2 gallon 28 gauge black pail up to a 6.5 gallon 24 gauge open head black pail. Lids for open head steel pails are sold separately. Lug covers or dish covers with leverlocking rings are available for most pails depending on if a certain UN rating is needed for your product. Most of our steel pails are UN rated for transportation of hazardous material. Some of the pails are lined, while others are unlined. The 5 gallon open head pail shown in the picture is an unlined green can with rust inhibitor. It is our item # JAC-10PH-CG-A4WA. It has no UN certification. We sell a black lug cover (item# CSCC-30-01LC) as an option for this pail. You may order a dish cover and leverlock ring instead, as there is no UN rating associated with this pail. If shipping by common carrier, 84 pails fit on one tray. Please click this link and scroll down to see a complete list of our steel can offerings including pails, covers, Rieke flexspouts, and Rieke flexspout crimping tool.